This is post is kindasorta both a Tricky Dicky and a Psychic Landscape entry. It doesn't quite fit into either series, but should - hopefully - be read in the context of them. We are now in an odd, reversed position when it comes to William Shakespeare and Richard III: all of a sudden, and for the first time, we seem to know where Richard III's head is, but not where to find Shakespeare's. I’ve written in previous instalments of this series about the relationship between Richard III (the man), Richard III (the play), William Shakespeare, and history. Aww, don'tcha just love the bourgeois mainstream? I mean, ain’t they precious and priceless? Isn’t their disingenuous, blithe, untroubled faith in recieved opinion; and their unquestioning belief in the fundamental goodness and honesty of the world they live in; just kind-of adorable? Like toddlers who treat Mummy and Daddy like all-knowing, ever-protective gods. And aren't they sweet the way they get all serious about pondering the eternal verities they take for granted, like the way little kids are when they get all serious about a let’s-pretend game they’re playing. 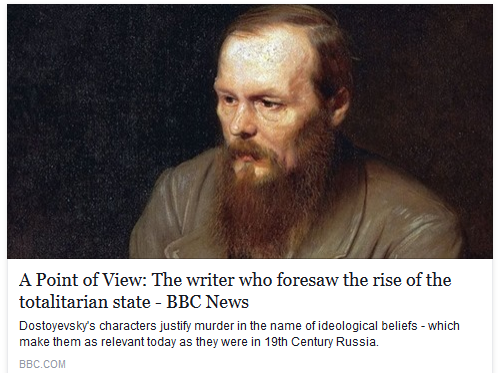 Dostoyevsky’s characters “justify murder in the name of ideological beliefs” which, according to the BBC, means he “foresaw the rise of the totalitarian state”. Because it goes without saying that ‘democratic’ states never ever justify murder ideologically. Nuh-uh. The idea. Mindless, vacuous, unconcerned contentment of this type is sort-of cute, like the way cattle just mooch aimlessly around fields taking in the same sights over and over again, and happily munching on the cud.